A major clean-up operation is underway following flooding that affected some Perthshire communities on the 17th July 2015. Villages such as Bankfoot were affected and surface water flooding was seen across much of the road network; however the flooding impacts were most critically witnessed in the town of Alyth. 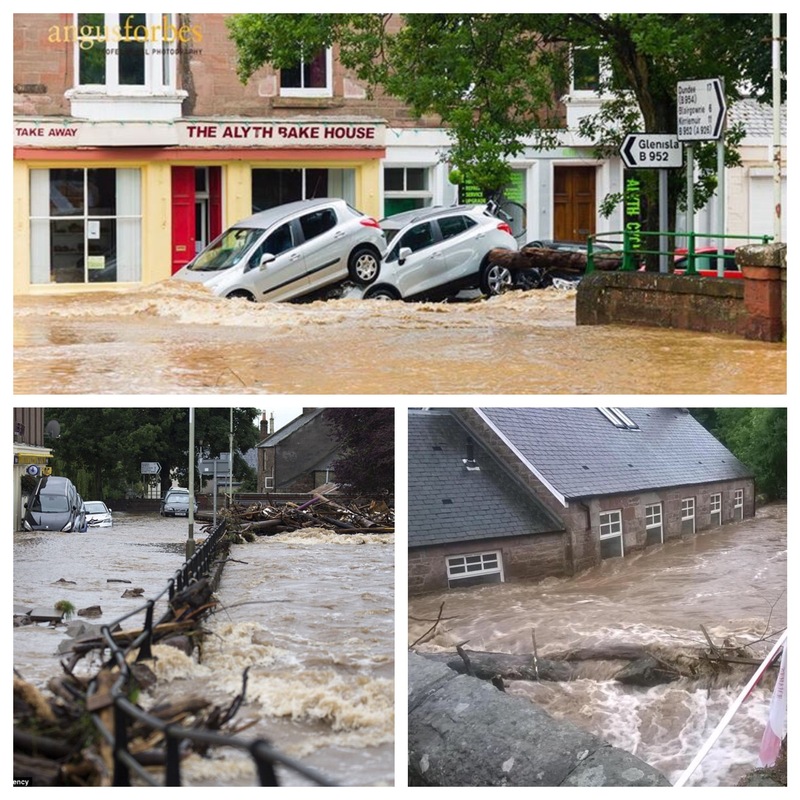 During the morning of the 17th July, serious flooding from the Alyth Burn resulted in the evacuation of 70 homes and businesses, significant impacts on bridges, with cars being swept along due to the force of the water, and over 750 properties being left without power. The spell of heavy rain originated from an occluding frontal system associated with a low centre near North West Ireland which tracked northwards across Perthshire on Friday morning. It was an active frontal system with the rainfall amplified by uplift over the hills with embedded heavy showers. Numerical weather prediction models were highlighting this area well; the UKV model was estimating a broad area of 30 to 40mm in 6 hours and MOGREPS-UK (ensemble forecasting system) producing a greater than 80% likelihood of more than 30 mm in 6 hours across central Perthshire. Although the investigation into the cause of the flooding continues, the relatively short duration of the intense rainfall has certainly been a contributing factor. 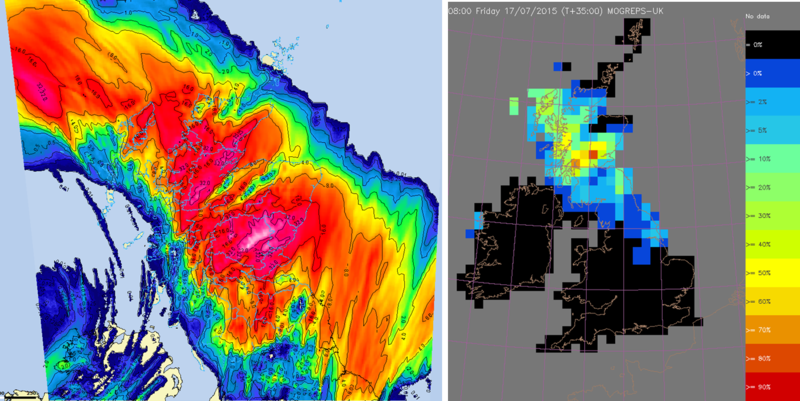 Previous research into flooding impacts carried out by the flood forecasting service suggests that this depth of rainfall over this short duration has the potential to lead to significant flooding. Although there are no raingauges in the immediate vicinity of the Alyth Burn catchment, some raingauges in the area did record significant 6-hour accumulations including Kindrogan (40mm) and Perth (43mm). Radar estimates across the small catchment provide the opportunity to estimate the distributed rainfall depths for the Alyth Burn catchment with totals being estimated in the range of 30mm in Alyth to 42mm in the headwaters. Figure 3: G2G (a 1km distributed hydrological model for Scotland) highlighting areas of greater than 60% of ensemble members above the 2-year warning level (left) and model predictions and observed flows for the Craighall gauging station. Likewise the hydrological model Grid-to-grid (G2G) was also suggesting likely response in the river systems across Perthshire and Angus. The lack of gauged data for smaller catchments, such as the Alyth Burn, in the area makes it difficult to assess the accuracy of G2G estimated flows, however for some gauged records it appears that the severity of the flows may have been underestimated in places (River Ericht at Craighall observed peak flow estimate 335 and UKV deterministic G2G prediction 226 cubic metres per second). Figure 4: The Flood Guidance Statement area of concern map issued to emergency responders on the 16th July. With meteorological models indicating a medium to high likelihood of rainfall depth-duration leading to significant impacts in the area (from historical analysis), could we have been more confident in our assessment of the flooding impacts scenario. This may have resulted in a higher overall flood risk status. The hydrometeorological forecasting tools were all indicating a spell of potential flood disruption yet pinpointing exact locations of the more significant impacts is always challenging. More direct links to SEPA’s national flood risk assessment and potentially vulnerable areas might help steer future resources to at risk locations, especially where no flood warning schemes exist. For information on the how flooding hazard impacts are forecast please read our guide to the Flood Guidance Statement. This entry was posted in Flood, Forecasting, G2G, Hydrometeorology, Risk communication, Weather prediction. Bookmark the permalink.